Sima Singh Ghosh is the best makeup artist in Kolkata, filled with creativity. Simadi is well known for her exceptional Bridal Makeup talents. Having a Successful career from last 20 years in the field of bridal makeup in Kolkata, simadi has established the real sense essential for an exact Makeup Artist for bridal makeup in Kolkata. She has many international and national ramp shows in her credit. She also has a beauty training institute under the brand name "Dream Bridal" in Kolkata. Simadi, the best makeup artist in Kolkata has done makeup for many popular television shows and serials. She also has done makeover for many ramp shows. Various types of skin treatment have done here including bridal makeup. Best Bridal Makeup Services offered. Best Facial Services offered d .
Dress & Ornaments(on rental basis). 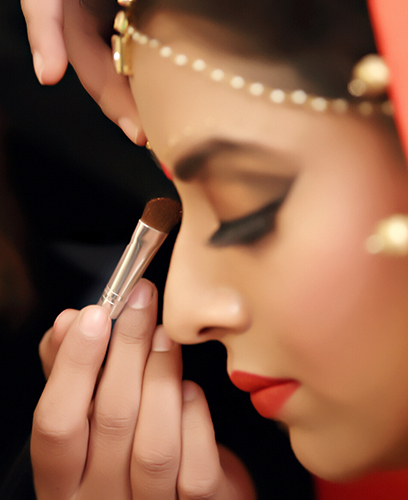 Simadi can take care of makeup jobs in all over the country. Just give us a call and book your schedule much ahead to ensure your booking. Simadi Makeup Artist in Kolkata believes in using only natural and herbal products in makeup thus no skin damage. Every makeup job is taken care with equal care and responsibility and only trained makeup professionals are entitled for every event. Simadi Makeup Artist in Kolkata believes in best services for everybody. Hence our rates are quite reasonable and within the reach of all. Simadi makeup artist in Kolkata can cure your Skin related issues effectively using all herbal & natural products, Get a healthy glowing skin naturally.